Need an executive piece of glassware to decant your best spirits into? You’re in luck, our promotional Decanters are here to do the job. Designed to impress your guests, customised decanters have been around for a long time and are perfect for when entertaining. As either a corporate personalised gift for the mantlepiece or something to take pride of place in a hotel or bar, these custom printed decanters add a level of sophisticated elegance to a drink. Personalised with your design, branded decanters are sure to make an outstanding impact on all who see them and spend many years with anyone that receives them. Here at MoJo we have carefully selected our range to ensure you get the best quality products and styles. One of our favourite is our customised Crystal Square Spirit Decanter which is laser engraved for a high end finish to your personalisation. 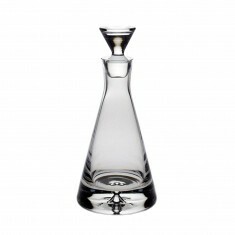 Embodying the traditional crystal stopper and reinventing the body for an ultra modern, geometric and minimalistic design, this decanter is a perfect combination of both styles. 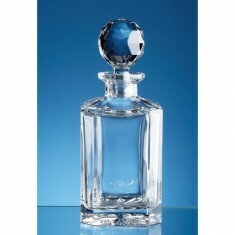 Want to get an idea of what your decanter will look like when it’s branded with your design? Give our sales team a call who will be happy to arrange free of charge visuals for you. 0.8L capacity. Facet stopper. Large engraving area. Outstanding premium design. 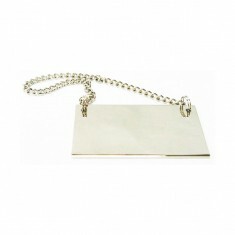 Give your bottles a boost of luxury with our customised Decanter Tag. 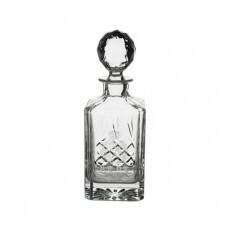 With its..
A most popular decanter is made with 24% lead crystal, it is cut on 3 sides cu.. Crystal. Pyramid shaped. Flat stopper. 75cl capacity. Individually boxed. Square shaped spirit decanter. Crystal facet ball stopper. Individually boxed as standard.